It is great to be back in Vancouver, Canada for Christmas. Of course, no trip some 4,700 miles westward goes without the Oilholic taking his customary walk from the City’s Waterfront facing Vancouver Harbour to Beach Avenue facing English Bay, and watching both waterways interspersed with oil tankers of all description heading in and out of the Burrard Inlet to Port Moody. Business is ticking along even in trying times, if this blogger's unscientific assessment of traffic volume is anything to go by. At the moment, the Western Canadian Select (WCS) is seeing its weakest price since the first quarter of 2014, and hit sub $30 per barrel levels at one point this month with regional inventories at a record high. Kinda feels like the marginal oil price recovery of 2017 didn’t really hit these shores customarily used to trading their benchmark at a steep discount to the WTI (roughly $5-7 per barrel in the old days, typically $12-15 and currently well above $20). But such a pricing level brings in fresh interest too, and of course arbitrage opportunities depending on what’s afoot elsewhere. According to a Reuters report, South Korean refiner GS Caltex recently picked up a rare cargo of heavy Canadian crude from Vancouver. It seems 300,000 barrels of Cold Lake heavy sour crude were loaded onto the Panamax Selecao on 13 December. The consignment may not be the last; the Cold Lake heavy sour is quite close to pricier Middle Eastern heavy crudes. Sources here also suggest other Asian refiners might want to go down GS Caltex’s path, including its domestic rival Hyundai Oilbank. 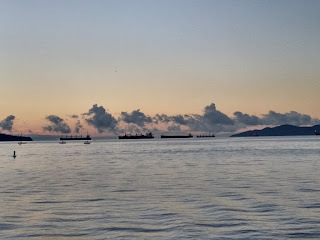 If that were to materialise, as opposed to what is quite frankly a small trial consignment taken by GS Caltex, the crude world could see meaningful cargo dispatches from Canada to South Korea for the first time since 1995, and well more tankers on the English Bay horizon. Away from here, the latest rig counts from Baker-Hughes point to a decline in the number of Canadian rigs by 28 to 210, while the US rig count was broadly unchanged at 931, up one on the week before. Finally, here's the Oilholic's latest Forbes post on the 'OPEC put' versus direction of the oil market in 2018. That’s all from Vancouver for the moment folks! Keep reading, keep it ‘crude’! © Gaurav Sharma 2017. 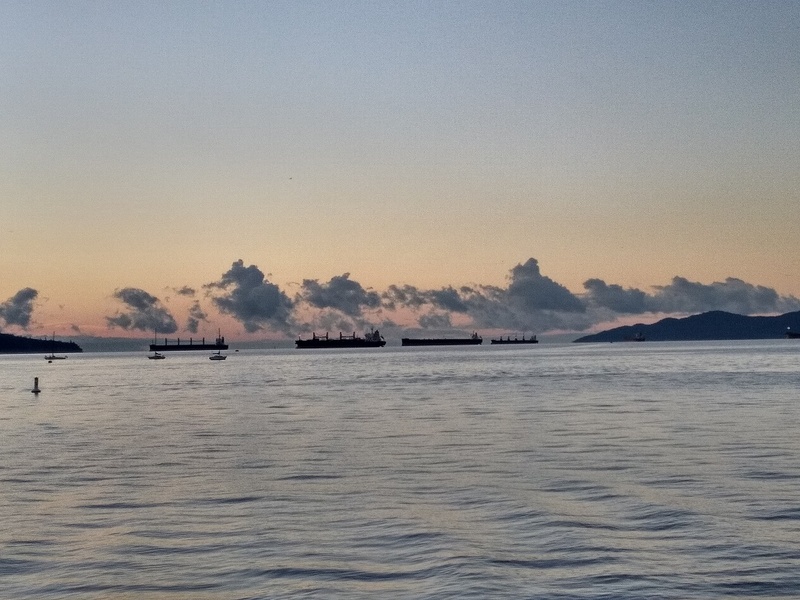 Photo: Oil tankers at sunset on Vancouver's English Bay, British Columbia, Canada © Gaurav Sharma 2017.